Junk silver is silver coin that is in fair condition but has no numismatic or collectible value. Junk silver is not scrap silver. It is sometimes called circulated silver. Like bullion, it is valued for the amount of silver in it, that is melt value, rather than the face amount on the coin. Mercury dimes, for instance, may be considered junk silver unless they are particularly high quality, have errors collectors want, or are from a key date or mint. Most circulated silver coins from the late 19th and 20th centuries would be considered junk silver, that is US silver dimes, quarters, half dollars, dollars and even nickels from certain years. There are coins from many countries that also have silver in them and in their circulated state might be marketed as junk silver. What’s wrong with junk silver? Even though it is called junk silver, it is not garbage! Junk silver is just an industry term. Many people start off their collection with “junk silver” because it is easy to buy in small amounts. Furthermore, what is collectible to one person may be considered of little interest to another. When you are trying to build a coin collection, for instance, you may start out with coins that are not the highest numismatic quality, however, if it allows you to complete your collection, there is nothing wrong with it. One man’s trash is another man’s treasure, as they say. Ultimately though, it is silver. One of the challenges with junk silver is the amount of silver actually in the coins. For American money, the amount of silver can vary between 35% and 90%, depending on the coin and the year. (see the chart below) For world coins, it depends on the coin, the date and the country. A German silver Deutsch 1915 is 90% silver, but one from 1925 is 50% silver. A great resource for the amount of silver, and hence melt value of world coins is the NGC website. It may be junk but it ain’t garbage! What Types of Coins are Considered Junk Silver? Because there are so many different types of silver coins around the world, I am only going to focus on the most common US silver coins. Except for error coins, special dates or mint marks, or some other reason for scarcity, the coins below would be considered junk silver. Even coins that are old, if they are too worn or damaged may be valued only by their melt value. To determine the melt value of the silver in the coin, multiply the current price of silver per gram times the number of grams in the coin. At about $15.5 per ounce, silver is worth about $0.50 per gram. So a JFK 90% silver half dollar with 11.25 grams of silver in it would have a melt value of a little over $5.50. *The 1976 Eisenhower silver dollars were minted as collectibles, so they are not readily available nor are considered junk silver. What are the Premiums on Junk Silver? Silver junk coins have some of the lowest premiums of all the silver products. Depending on availability, premiums will usually run between 10% – 12%. Lower quality coins, or taking the coins in all dimes, or all quarters will reduce your premiums as well. The less cost incurred by the dealer in sorting coins, the lower the price to you. Many dealers sell junk silver by face value (FV), that is, they will sell you $8.25 of face value (FV) of circulated silver. You can see by the table above, quarters are 2.5 times the weight of dimes, and halves are double the weight of quarters. $1.00 FV of silver quarters will have 22.5 grams of silver. $1.00 FV of dimes or halves also have 22.5 grams of silver in them. The dollars on the other hand, have 24.057 grams of silver in them. So, when buying an odd lot of coins, the more 90% silver dollars you have, the more silver you have per $1 FV. 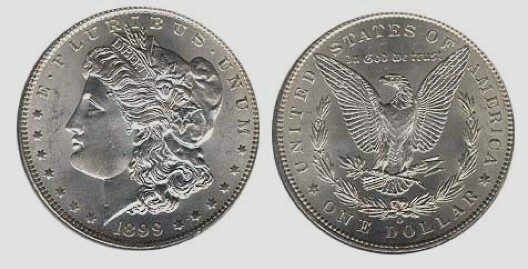 That is why 90% US silver dollars are priced higher than a combination of 90% silver smaller coins. Most dealers will not sell fractional dollars with dollars, but you may find some lots like this on eBay. Many of the larger dealers will sell coin bags of $100 to $1000 face value. Again, you are buying and ostensibly paying for the silver content of the coins, but if you go thru the bags carefully, you may find a little treasure with some numismatic value also. If you are interested in the collector value of silver coins, check out the price guide at PCGS. Why do I want Junk Silver? Silver is silver. Circulated silver coins are easily divisible, easy to carry, easy to invest in with a huge market, and they still have a currency value. I am not sure why you would ever sell your silver for the face value of the coin, but if silver became worthless, your quarter would still be worth a quarter. In the previous scenario, if silver becomes worthless, I am not sure what good fiat currency would have, but you get my drift. Investing in “junk silver” can also a fun way to start a collection. Also, it is less likely that small denomination silver coins will be counterfeited. It has been reported recently that Morgan and Peace dollars have been counterfeited and sold on the Internet. The smaller the unit value of the coin, the less likely it is to be faked. Where can I buy Junk Silver? You can buy junk silver, or circulated silver coins at most coin and silver dealers. You may also find them in pawn shops, at yards sales, outdoors shows, or even the gas station. I have purchased junk silver at the bank – more on that later. You can also find numerous junk silver sellers on eBay and other auction sites. Check out our directory for a list of coin dealers near you.